I've always loved root beer. Always. Around 2008, I made it a point to buy a new kind of root beer if a saw one in the store. So I often came home with random solo bottles, 4-packs, or 6-packs of new root beer to try. 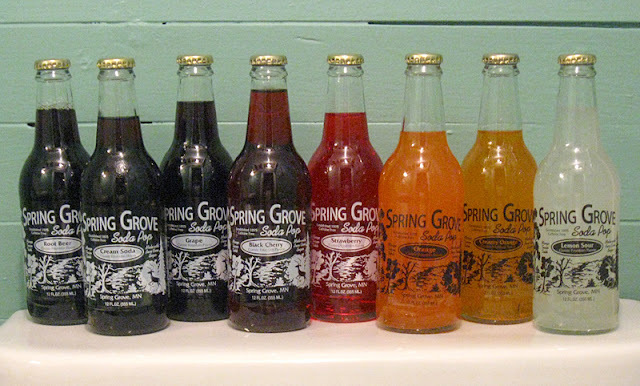 You could say this blog started with my first case of Spring Grove Soda Pop. But it's been an idea in the works for years. I'll post a mini-review here whenever I have a root beer or other "non-mainstream" soda. I'll point out local and national distributors of sodas that I like. I'll try to share anything delicious in the "soda world" that I feel like others should know about. I have no deep insight into today's non-mainstream soda market. I don't know anyone on "the inside." I do not claim to know it all. (In fact, I welcome any info, tips, or leads on good soda, especially local brews.) I'll simply share the delicious, sugary findings along my journey with all of you. Hi Steve! I followed the link from Steve in a speedo because, well, I like rootbeer :) I really got into rootbeer a few years ago when I realized there's a difference between HFCS sodas flavored as root beer (barqs and A&W in a can) and a brewed root beer. I might have to take a trip with my wife down to Jordan to check out the candy store! Hi Mike! Thanks for stopping by. Someone else just commented about the use of HFCS, so I'm going to start noting how the sodas are sweetened in my reviews. And yes, check out "Minnesota's Largest Candy Store!" A must try but must-travel-to-do-so root beer is the absoutely heavenly libation made at and sold at Wagner's Brewing Company in Lodi, NY. I get my growler filled each time we go there on vacation. I just contact them via their FB page... I'm seeing if they can ship their Root Beer. Thanks for the tip! Just found your site! very cool, keep up the good work. perhaps we can trade sometime. so this is the other place I've tried that Brandon and I REALLY like their root beer ... and they ship! http://www.zuberfizz.com/pages/buy-zuberfizz-online/mixed-15-pack.php ... apparently they're the ones who made the coco fizz ... didn't know that. but even though they don't have TOO many flavors, the root beer is tasty enough to get a few bottles of it. Lester's Fixins Sweet Corn Soda. Yes, SWEET CORN.